It came as a shock to the scientific community when in late November, He Jiankui, a Chinese biophysicist, claimed that he had created the first genetically edited babies using CRISPR, a new gene editing technique developed in 2012. Not only would this mark the first use of CRISPR in humans, rather than in cell cultures, but it would also be the first time anyone has altered a human germ line: the cells which allow traits to be passed onto offspring. This unprecedented and controversial use of CRISPR calls into question the readiness of using this rogue gene editing more frequently. Gene editing is a technique which changes the DNA sequence of an organism. This sequence stores all the information necessary for the development and function of every living organism. By editing the DNA of a human, their characteristics can be changed; this can range from hair colour to correcting diseases caused by changes in DNA. Being able to alter the characteristics of an individual requires careful ethical consideration and calls into question whether it is right to design babies and essentially “play God”. Many consider it ethical to edit genes to treat an individual suffering from a genetic disease — this takes the form of gene therapy and does not affect germ line cells. Altering these cells is one of the major reasons He’s work has been called into question. It should be noted that this technology has been used in many non-human organisms. For example, it has allowed for delayed ripening in tomatoes to decrease food waste and increased crop resistance to insects in corn. Human gene editing requires more accuracy than crops in order to minimise damage to non-target functional parts of the DNA. Recent advances in genome editing have specifically targeted this drawback. Editing the genome requires 1) cutting the DNA and 2) introducing a new piece of DNA to repair it. The key to the second step is that it exploits cellular DNA repair processes, which can paste in a new piece of DNA that is introduced to a cell. All that is required is ensuring that the DNA is added to a cell sufficiently similar to the cutting site, where the DNA sequence is to be changed. The first step was much harder to figure out, because scientists for many years could not cut the DNA at the correct position. The solution was found through CRISPR, which is essentially a set of molecular scissors that cuts at a very specific location in the DNA. What makes this technology more effective than its predecessors is its use of a modular template to help localise the scissors to the right spot, allowing cuts to be made quicker and cheaper. He Jiankui performed this CRISPR gene editing while carrying out an in vitro fertilisation (IVF); an embryo outside an individual’s body is a much easier target for CRISPR compared to natural embryogenesis. He received embryos from seven couples where at least one of the parents was HIV-positive and claims to have edited the genome of the embryos to be resistant to HIV, stating that his edit prevents the virus from being transmitted from parent to offspring. He disabled a gene called CCR5 by introducing a mutation that is found naturally in the human population, which renders HIV unable to infect human cells. A successful pregnancy was achieved in only one of the seven couples, where twin babies were born. One twin had two copies of the gene edited, the other had one. He’s research has not been published into a scientific journal, so it is unknown whether his claims of genetically editing the twins are actually true. He Jiankui believes his research was justified, stating that CRISPR has “real-world medical value” in reducing the 1 million deaths annually associated with HIV/AIDS. However, since making his research public, he has received significant backlash from the scientific community. 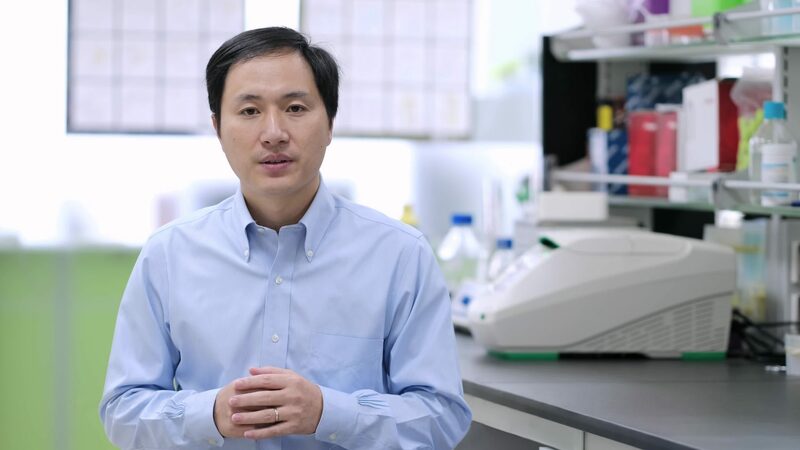 The university where his lab is located, Southern University of Science and Technology in Shenzhen, China, released a statement stating that “He’s conduct in utilising CRISPR/Cas9 to edit human embryos has seriously violated academic ethics and codes of conduct”. China’s National Health Commission have begun an investigation into his claims. He Jiankui has been missing since 3rd December and Southern University of Science and Technology have denied rumours that he has been detained. Scientists around the world are aware of the ethical responsibilities they have. CRISPR has the potential to edit the genome of individuals in unimaginable ways, however no one had dared edit the germ line of a human using CRISPR before. This is largely because CRISPR is imperfect; sometimes it can create cuts in DNA in undesired positions, causing gene disruption, genetic diseases or cancers. Although some gene therapies have been approved — such as liposomal gene therapy for treating cystic fibrosis — those that are used on cells inside an organism employ older, well-studied techniques. CRISPR has been used outside an organism when removing and altering cells before reintroduction, in therapies for leukaemia. The older, safer therapies are considered ethical because their results cannot be passed onto offspring, meaning that any problems arising from these gene therapies will not affect anyone beyond the individual receiving treatment. Moreover, gene therapies are often used as a last resort, where there is currently no other treatment available. Because gene therapy today is in its infancy and has the potential to cause diseases like cancer, caution must be taken where it is administered. Patients will only receive gene therapy if their chances without treatment are comparatively worse than the negative effects of using the technique. This is why leukaemia and cystic fibrosis are targets for these initial trials; without treatment the mortality rate is lamentably high. The main concern with He’s research is that he went against the scientific consensus and broke laws without consulting others beforehand. This is a poor strategy for scientific progress. CRISPR has not yet been proven safe for use on whole organisms, and this combined with his altering of the germ line, warrants the international condemnation he received. Many questions lie ahead regarding how gene editing technologies like CRISPR will be used. Thankfully, this single account of misuse has demonstrated how the global community can and should prevent such unethical practices. Ultimately, the single rogue use of the CRISPR technology must not sour its public perception. CRISPR has an immense potential to revolutionise the medical field and may provide therapies to hundreds of diseases that currently lack a cure. We must not let gene editing be dismissed because of a single case of its misuse — the future of medicine depends on it.